I've been flitting from one project to another lately, and not making much progress on anything. I did some work in the garden, finished some customer quilts, spent a weekend with my DD which was fun; there was a lot of handsewing on the vintage hexagons, and I finished knitting a shawl and a scarf. I haven't felt like sitting at the sewing machine though; the cold I had made me miserable and I just couldn't get warm enough, so I spent lots of time tucked up in bed with the dog and my knitting. Dolly certainly approved, she loved the company, but I'm better now, so she will have the bed to herself. On Tuesday I finally put the King's Crown top together, and then spent the next 5 days trying to find the perfect border fabrics for it. I was going to slap a green plaid on it and call it done, but Mereth vetoed that very firmly. 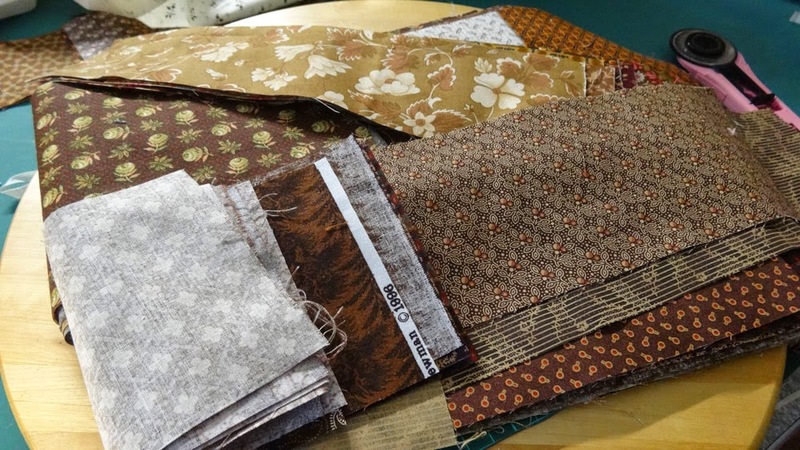 I must have pulled out every fabric I owned, but nothing seemed to work, and I really didn't want to buy anything. All the greens looked dull, the browns were horrible, reds made the sashing look brown and tans made it look pink. AAGGHHH! Finally I tried a madder print, and that was what I was looking for, at last! 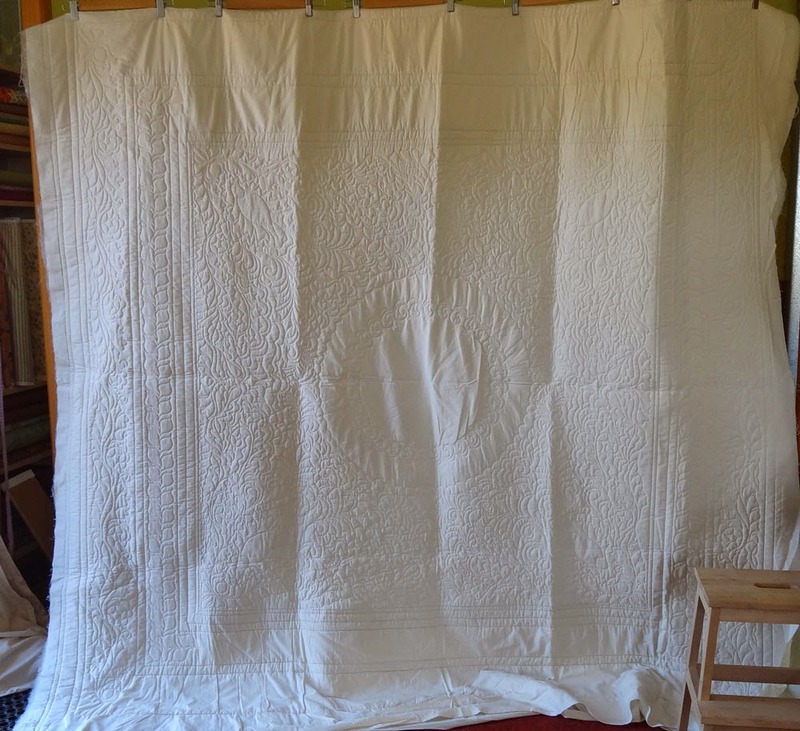 I spent the weekend quilting a Farmer's Wife quilt, and it was a big one, 87 x 104". While the Statler was stitching I managed to get the borders pieced and attached, so all in all it was a productive weekend. Now I have to put away all the fabric I pulled out, and tidy up the mess of scraps and leftovers. Then I need to pick another UFO to work on, how exciting. I've finished 17 so far this year, and I'm still enthusiastic about the rest on the list. I'm plodding away at these hexagons, but it's slow going. 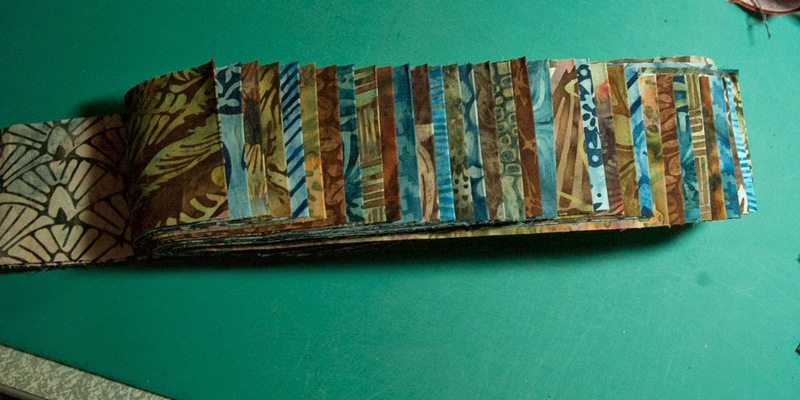 Our last trip to Jamestown was to pick up a layby at the patchwork shop; a batik jellyroll is tempting me to start a new project, and I think I've earnt that after all those UFOs I've worked on. I need to get my first batik quilt on the go, the longer I leave it the more apprehensive I get. I need to just cut into those precious fabrics and start enjoying them. This cold is horrible, I would love to be able to take to my bed until I'm over it, but that's not possible. I'm getting as much sleep and rest as I can, but some things just have to be done no matter how I feel. There is no-one who can take over our postie run, so we have to keep doing that, and there are quilting things that just have to be finished. I'm using a mask and hand-sanitiser when I'm sorting mail and quilting; I know it's unlikely to pass the germs on through objects, but it makes me feel a bit more responsible. I have to go down to Adelaide this weekend to help my DD shift house, and I really don't want to give her this thing; I need to get better before then. When my brain won't work and feels like it's just cotton wool and feathers, I sew a few seams of the latest thing on the design wall. 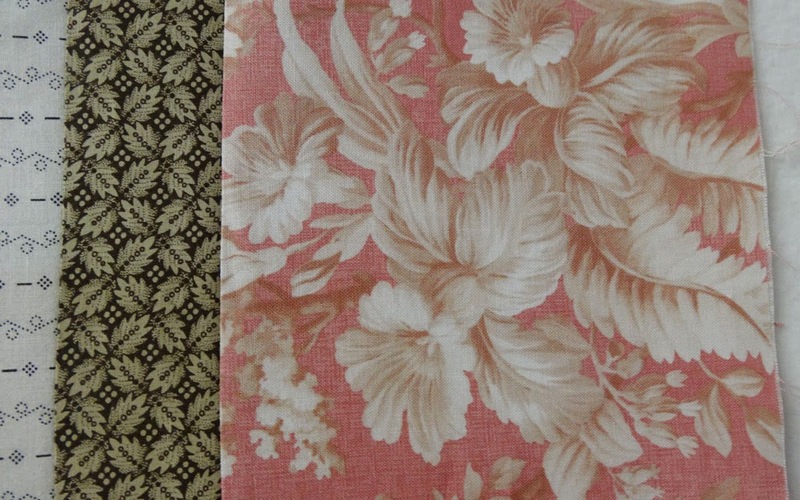 I'm putting together the KIng's Crown variation blocks, and I chose a rust coloured Thimbleberries fabric to sash it with. 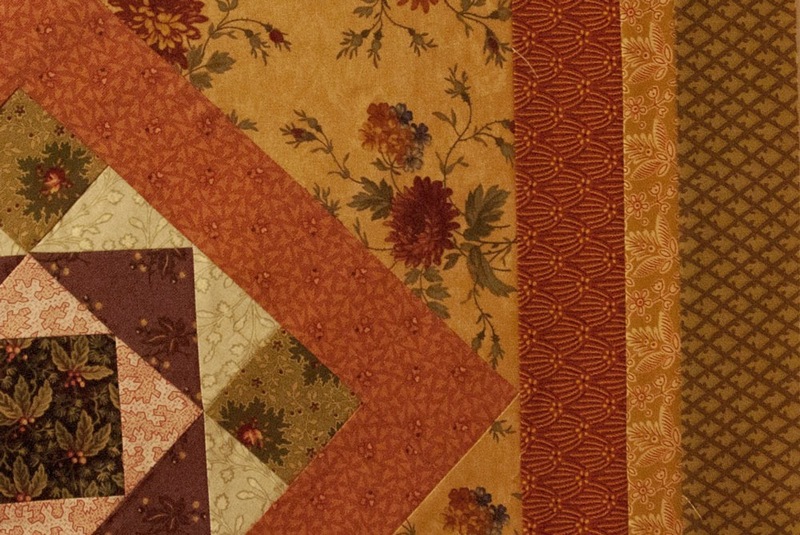 I want it to be a nice cosy, autumny quilt, and this fabric ties together all the colours I used in the blocks. I'm just slapping it together, and I probably should take more care, but I just want it finished right now. I do love these blocks, but I lost my way with the colours and what I wanted for them, so I will just get it together and call it done for now. I can always make another set of blocks later on, and knowing me, that's exactly what I'll do. 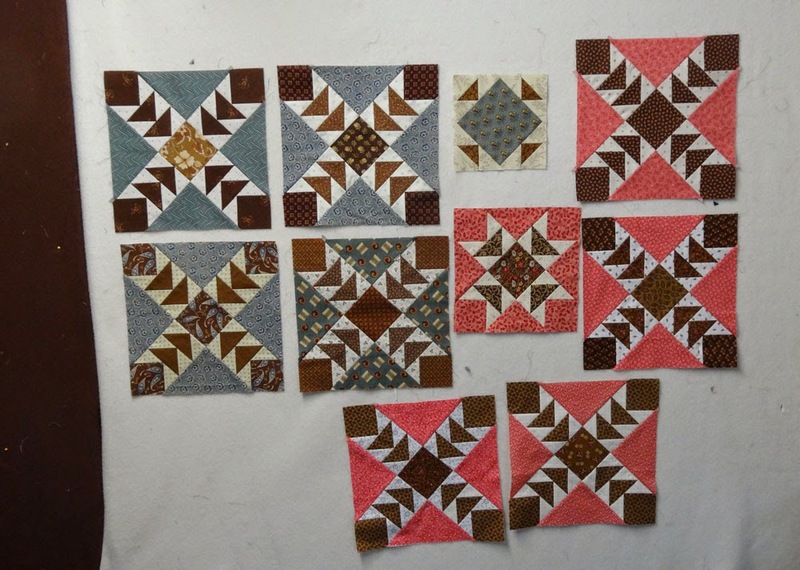 I have all the blocks assembled into rows, and I was going to start sewing them together last night, but the cotton wool feeling in my head meant that I wasn't making the right decisions about the whole process. I don't think I could have kept it all in the right order, so I gave up and went to bed. After I've done some more work today I'll get back to this and try to get it in one piece. I need the encouragement of a Finished Object! 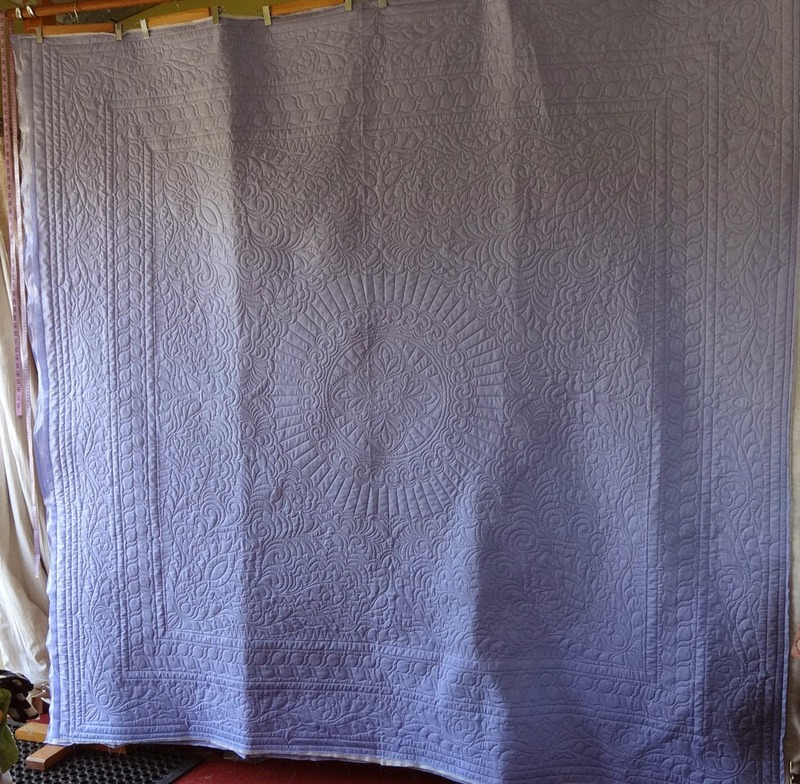 Last month I spent a lot of time quilting, and finished three wholecloths. One of them was a UFO from about 2002, so it was a good feeling to finally deal with that. 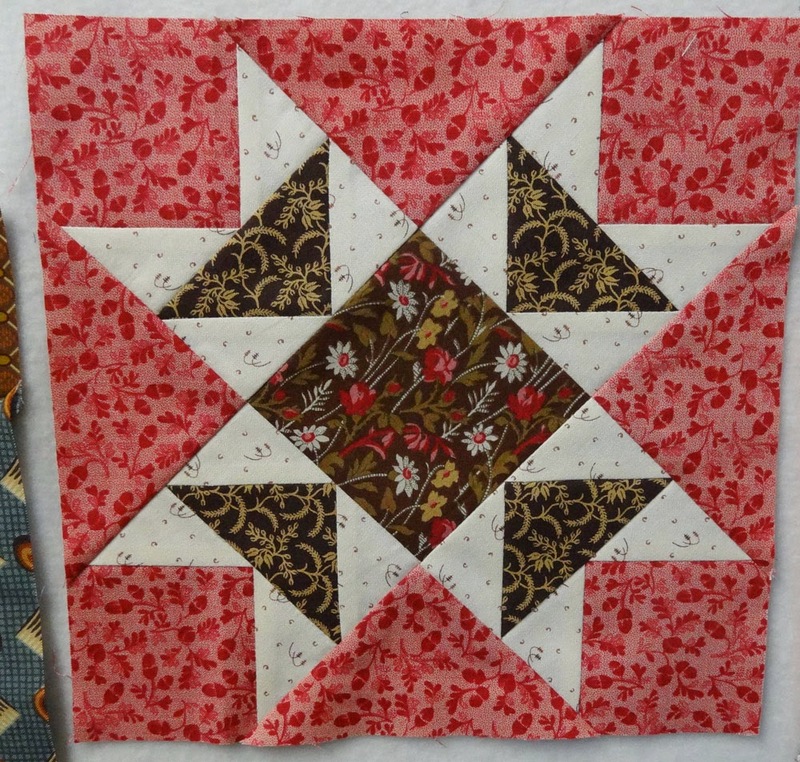 I did this as a class sample, and quilted it on my Gammil shortarm; unfortunately I ran out of time to finish it, and after the class I didn't have any motivation to complete it. 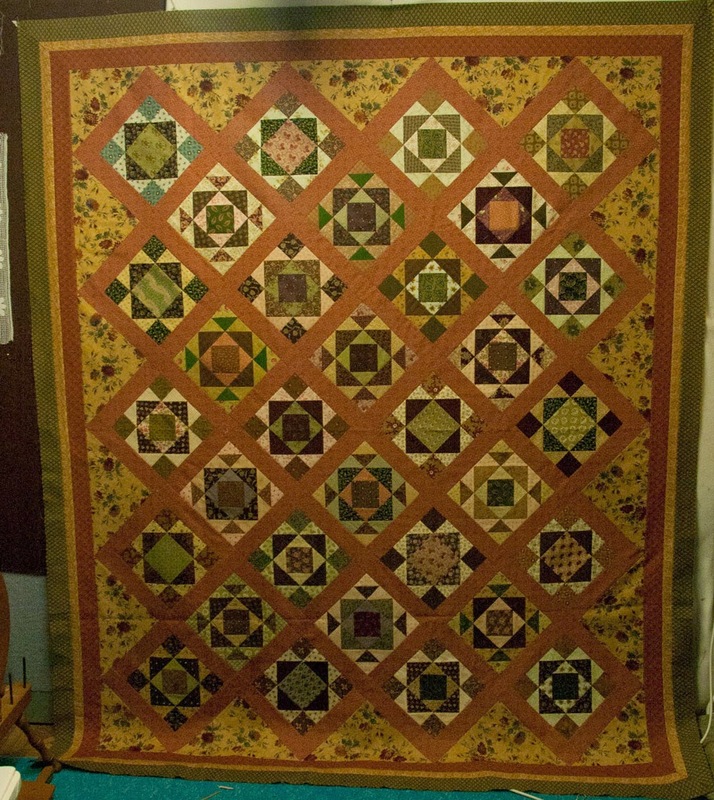 It needed borders on two sides, and the centre motif completed. I reworked the designs I used then, and was able to finish the stitching on the Statler. I love technology! 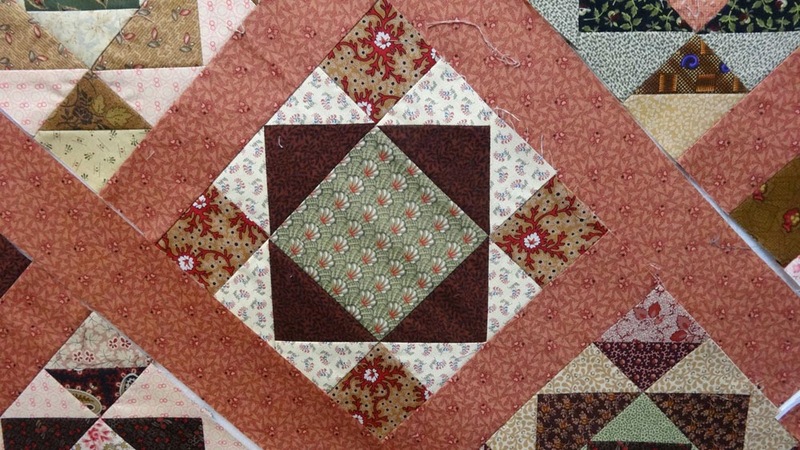 My determination to finish old projects even extends to old quilting projects it seems. I'm glad I've turned this from something that reproached me, into something that I can actually use. 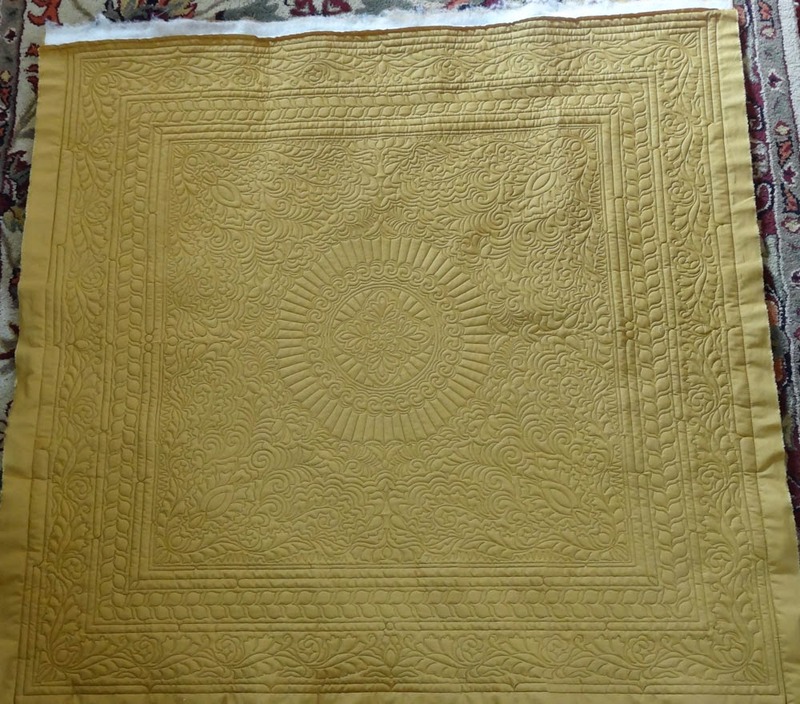 and a small wallhanging in a nice gold colour. 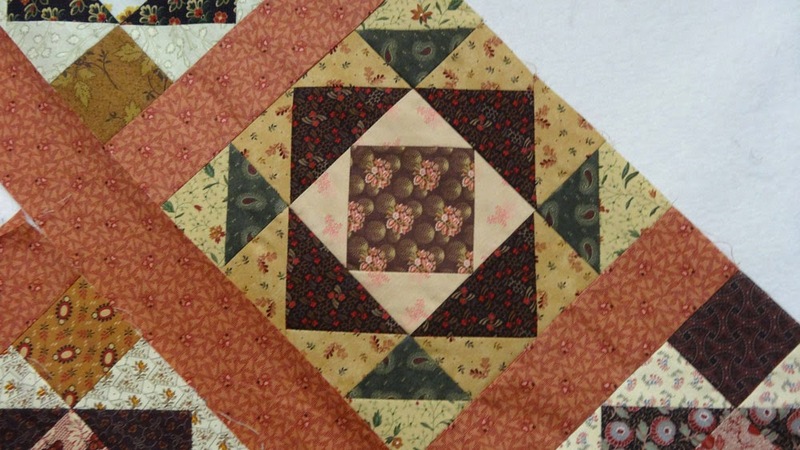 It's so cute at such a small scale, I really loved quilting this one. When I was stitching out my design all those years ago, struggling with the limited throat space of a shortarm machine, I never imagined that I'd end up with a Statler that would effortlessly reproduce whatever I dreamed up. 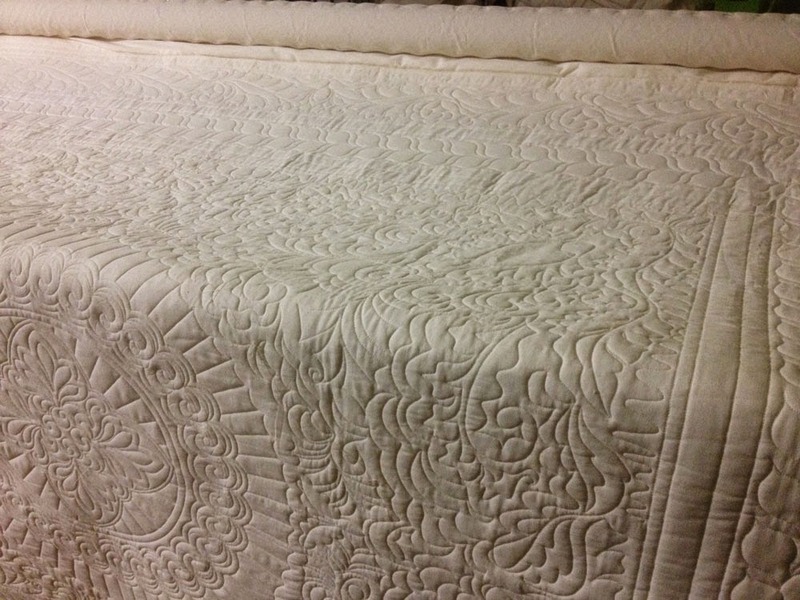 I love my quilting workroom, and what it helps me achieve; I've worked awful hard for it, but it feels like a blessing, and I hope I'm always grateful for it. 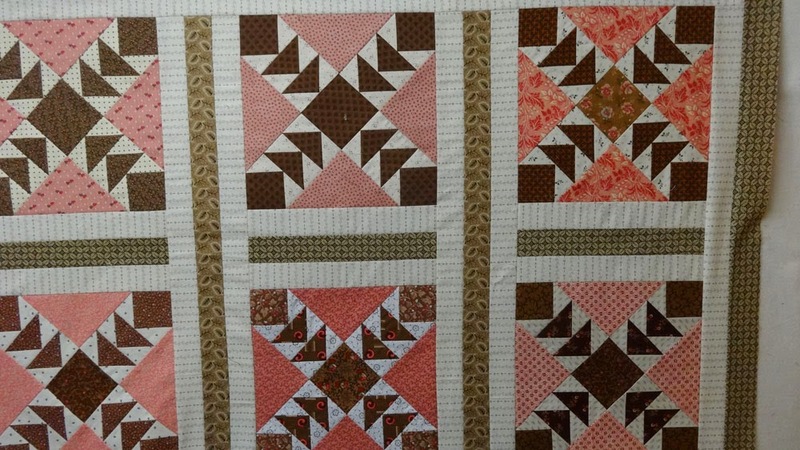 I spent most of yesterday trying to sleep off this cold, but there was time to add the borders to the Wild Goose Chase top. I auditioned quite a few border fabrics, but in the end decided to use the first one I tried. At least I'm sure now that there's nothing in my stash or Mereth's that I would have liked more than this. 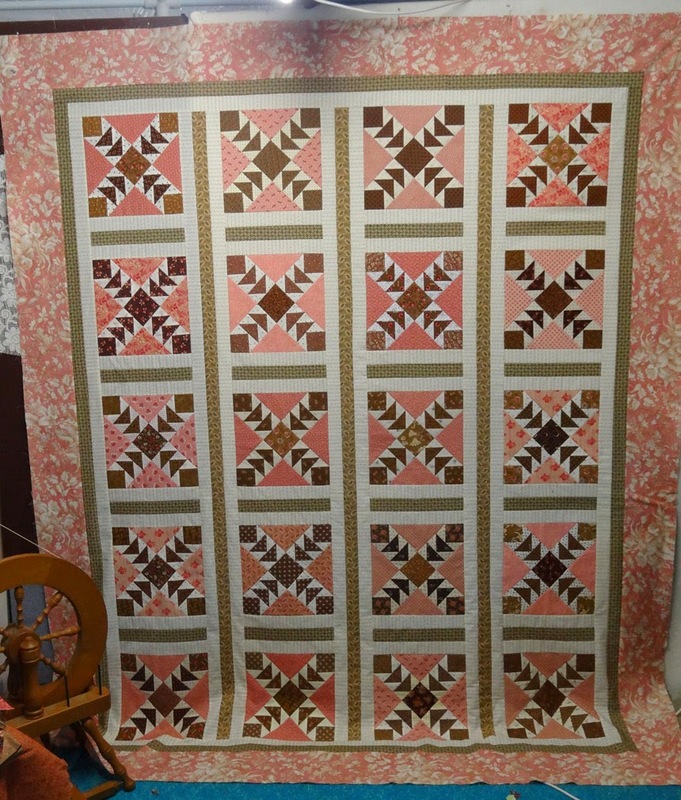 I never expected it to be such a soft and pretty quilt, I thought I was making a daring pink and brown statement, but it morphed into something sweet instead. I'm not really keen on bold colours, so it shouldn't be a surprise to me that my subconscious directed me to continually choose a softer palette. Somehow I always think I'm in control and it turns out I'm not. I'm really looking forward to starting another UFO, I have it all mapped out and ready to go, just as soon as I feel a bit better. The colours are very different from this, and that's probably why I'm looking forward to it so much, I do love to rummage through different fabrics from one quilt to the next. 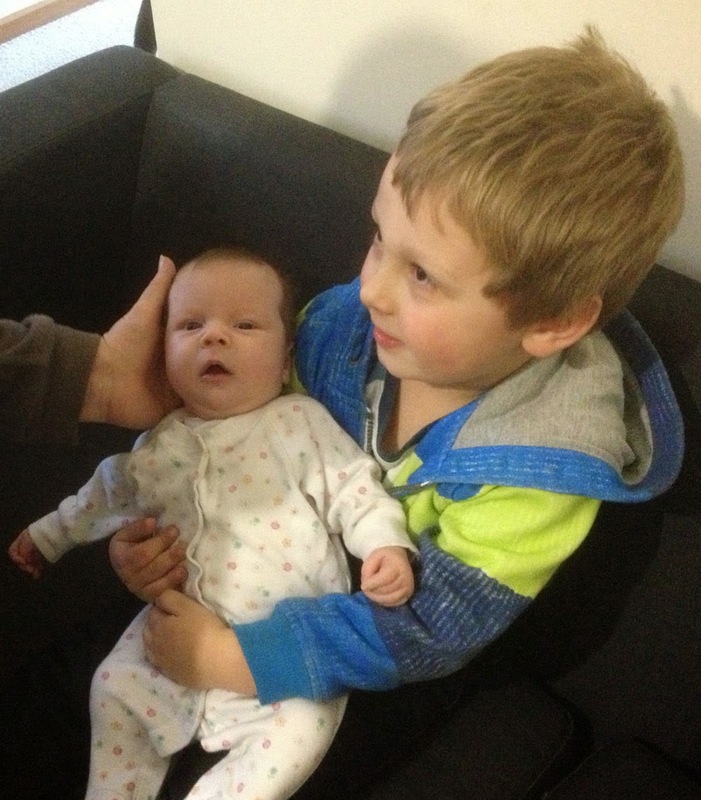 No time for blogging lately, too busy with babies and grandchildren and visiting relatives. Mereth's No.2 son and family came to visit from New South Wales, and we spent every moment we could with them. Logan absolutely loved Izzy, and sat cuddling her on the couch whenever he could. That's the start of a wonderful relationship there I think. Alas, they brought nasty colds with them, so now Mereth and I are sneezing and coughing and feeling dreary; it was worth it though. Logan has started calling us The Nannas, as in 'Where are the Nannas?' We are Plural!. It would be lovely if they all lived closer, there's nothing quite like having family around, especially when the babies start arriving. So where was I in the sewing room? 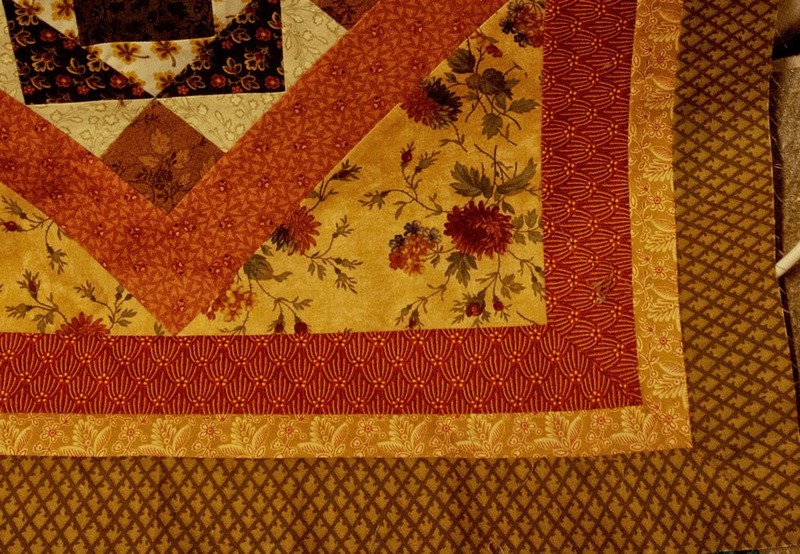 I've almost finished the Wild Goose Chase quilt, will have photos of it completed tomorrow. Just needs a border; I changed the setting a bit, I just can't leave things alone it seems. There are so many bits and pieces floating around on every surface, I need to spend this weekend excavating the piles and drifts of fabric, leftovers and scraps, until I'm down to bare surfaces and neatly catalogued boxes. I need Order! I threw all the blocks I came across up onto the empty design wall, so I could see what I had to deal with. 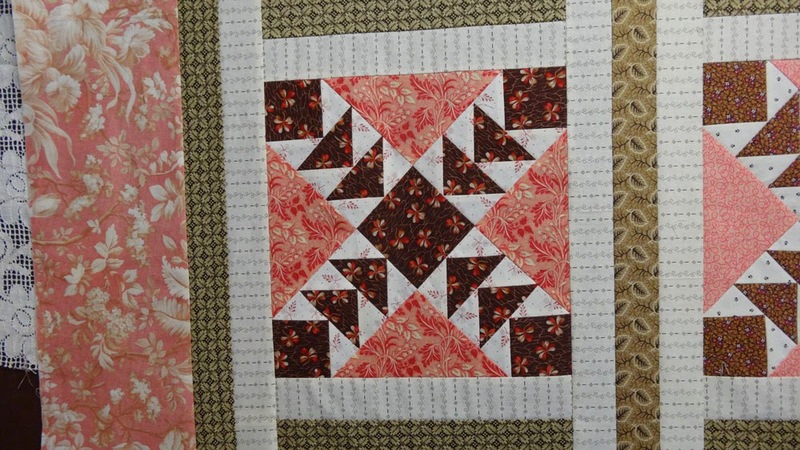 I have four leftover pink blocks, I think they will end up in the Orphan box because I don't want two quilts like this. 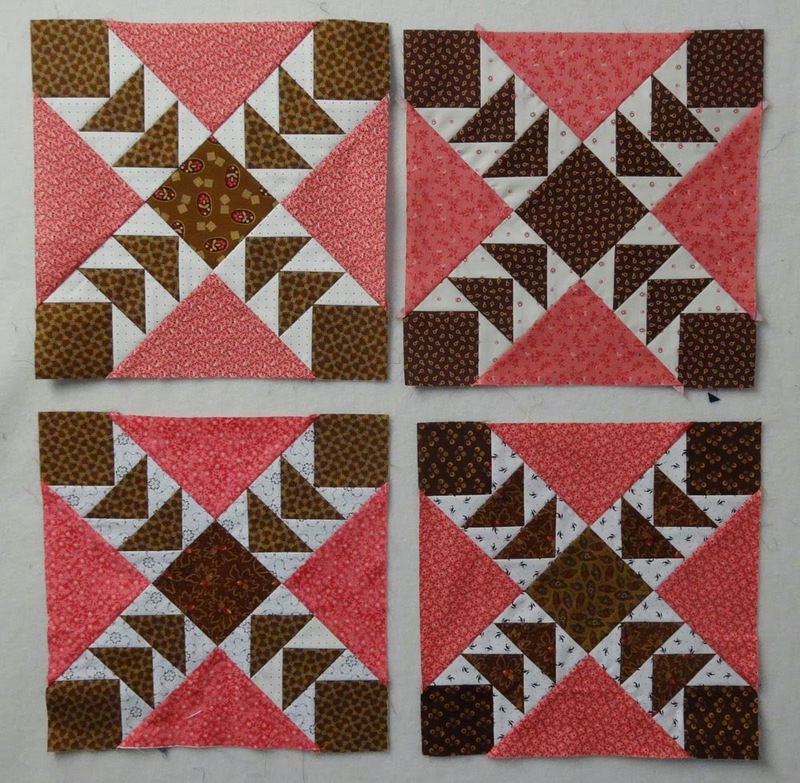 Lovely blocks, but they were a bit too dark for the quilt I had in mind. 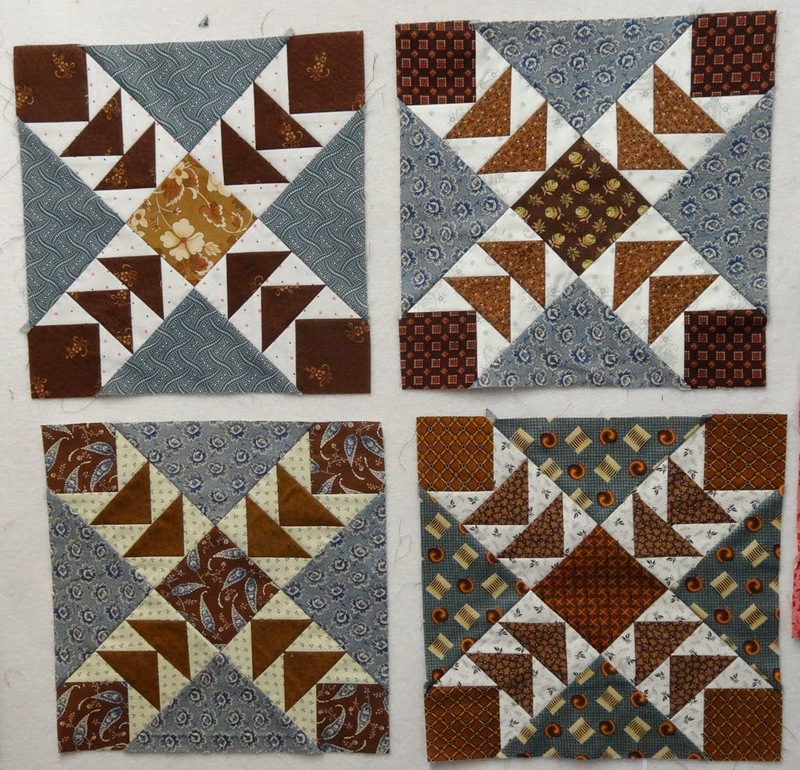 Then there were four blue WGC blocks that I made as a distraction; I love these, and will put them into a quilt one day, but not right now. So they will get a project box of their own, and I'll start putting aside fabric that I want to use in them. 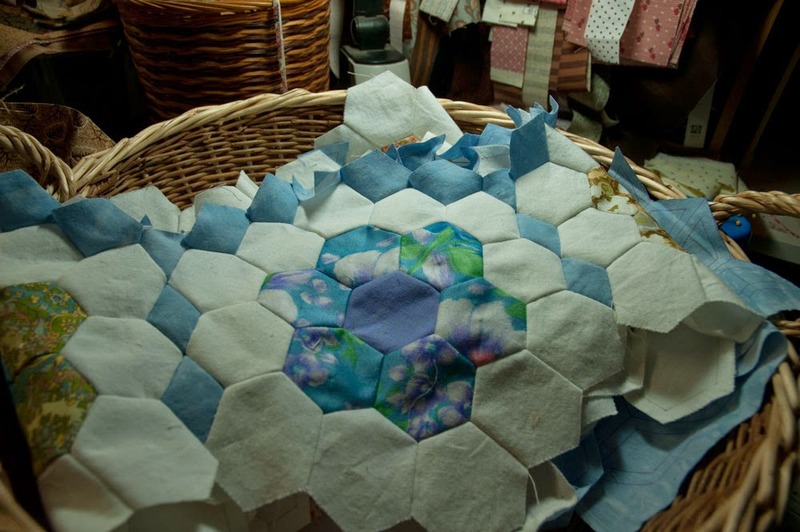 I am still cutting for my blue and brown quilt, that small block in the photo, so I'll cut pieces for the WGC at the same time. But good golly gosh! 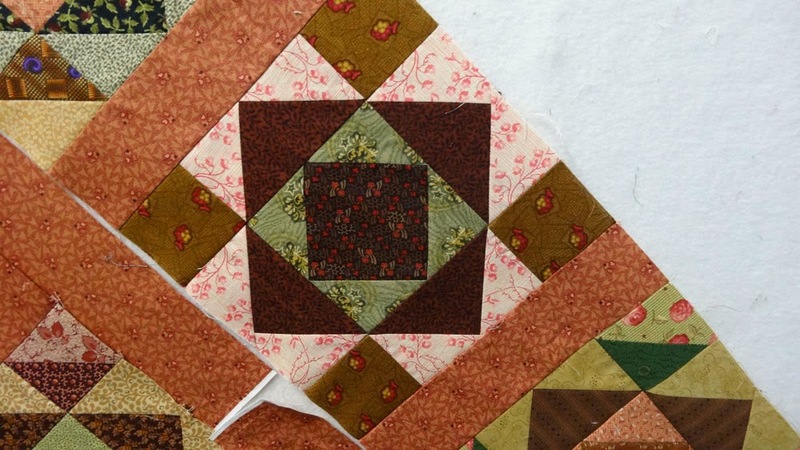 Look at what is leftover, after making enough blocks for one quilt and 8 spare blocks. It's my old overcutting-syndrome, I haven't been able to get that under control. So I wondered what would happen if I took one set of Flying Geese units out of the block, and this is what I came up with. 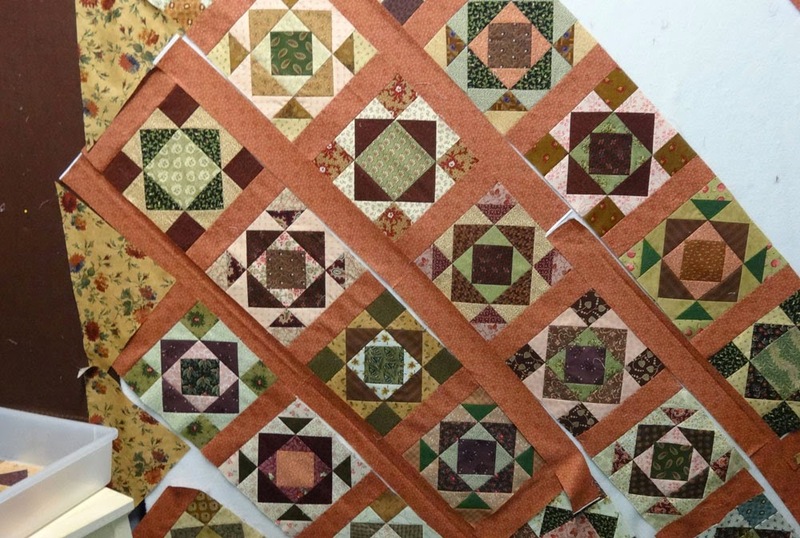 It's a lot quicker to piece, and awfully cute, so I will cut up the leftovers and kit up the blue WGC and a heap of these blocks at the same time. I can't find a name for it in Blockbase, but I'm sure I've seen it in an old magazine, so I'll try and hunt that down. So instead of crossing one UFO off the list, I get to add two more. Oh well, that's the way it goes, and technically they are Works In Progress, not UFOs. I feel better about that now.